If you live near the coast, your roof will be affected by corrosion caused by the sea air. Fine particles of sea salt, usually formed by the evaporation of sea spray, creates a salt haze – and it is this haze which corrodes your roofing screws, causing them to weaken. Once this happens their performance is greatly affected over their lifetime. Besides being caused by salt air, corrosion of roofing screws can also result from acids carried through the air from industry and chemical sprays, U.V. from the sun, or humidity in tropical or moist areas. 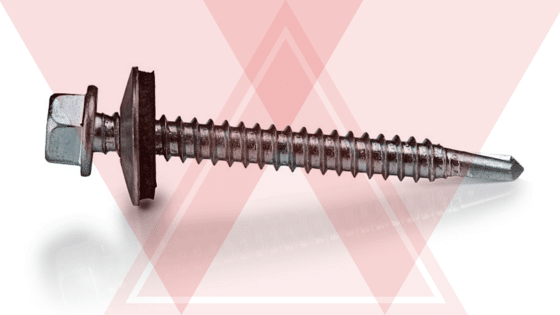 Roofing screws are generally overlooked as having a detrimental effect, and they are something that usually no-one notices until it is too late – and the roofing iron has to be replaced! Therefore, it is good policy to have the screws checked around every 5 years, as this will ensure that you keep on top of the problem of your roofing iron being affected by rusty screws. Corrosion is usually associated with metals such as steel, zinc and aluminium, which are refined from ore. When air, water or salt are present, these metals will quickly corrode. Oxygen will cause oxides to form, resulting in corrosion, and therefore causing the metal to eventually be turned back into the ores from which they originated. Rust runs down off the head of the rusty screw and on to the roof sheet itself. Over time this can develop into a rust hole in the roof sheet, with the very real problem of water entering the roof space. As you can see, this would then damage the inside of the building, resulting in a huge problem, not just confined to the roof itself – and would then be a lot more expensive to fix! 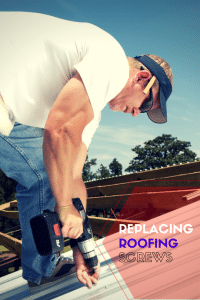 It therefore costs a lot less to replace the roof screws than the roof sheet that has become damaged due to the rusting screws! When ha ving a house inspected because you are considering buying it, make sure you are aware of the state of the roofing screws, and keep in mind the corrosion process, because what might not seem a problem at the time of purchase can develop into significant costs if not dealt with. If you are made aware of rusting screws at the time of inspection you will have the option of getting the screws replaced. Roofing screws are generally made of hardened carbon steel or stainless steel, and all roofing screws must have a sealing washer attached, which stops water penetrating the roof. There is an “Australian Standard for fastener performance (AS3566)” which was introduced in 1988. This lists four classes of resistance to corrosion, ranging from Class 1, where corrosion resistance is of minor importance (internal use) to Class 4, generally within 1 kilometre from marine surf (although strong prevailing winds may increase this distance). Roofs generally fall into Class 3, for ‘mild industrial and marine conditions’ – these are general living conditions; or Class 4, for ‘marine and moderately severe corrosive environments’ – living near the coast, or susceptible to industrial acids or chemical sprays. It is advised that stainless steel screws be used in Class 4. So, if you live near the coast, or in areas where chemical spraying is prevalent, it is important to be aware of these classes, and to ensure you use the correct – and good quality – screws for the best protection. Contact Rooftec Roof Painting and Restoration for your roof inspection – visit our Home page and fill in your contact details and we’ll get in touch with you; or ring us on (02) 49442010. Be assured that at Rooftec all materials used are from top suppliers and makers in the roofing industry. And remember, we offer a free quotation.